Donald Trump 71st birthday: The US President Donald Trump may be ringing in his 71st birthday amid a US Senate investigation into possible collusion with Russia during the 2016 election, but thousands of miles away, a group he has probably never heard of organized a birthday bash for the billionaire President. 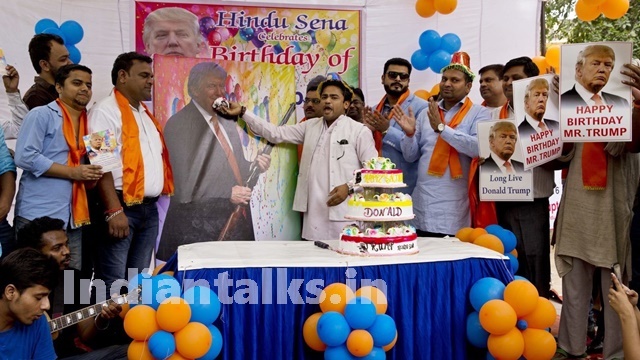 Hindu Sena, a radical fringe Hindu outfit, celebrated Donald Trump’s birthday, complete with a birthday cake, at New Delhi’s Jantar Mantar on Wednesday. 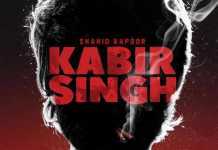 A small tent was erected at the designated protest site near Jantar Mantar and decorated with saffron and blue balloons. At 1 pm, Vishnu Gupta, leader of the Hindu Sena, got out of his car with a cake weighing 7.1 kg, to mark their “Messiah’s” 71st birthday. A group of men, allowing allegiance to Trump, scurried to put up pictures of the 45th US President, including one of baby Trump, on the tent wall. In addition to a handful of Hindu Sena workers and a few media persons, nobody really turned up for Gupta’s party. This is not the first time Hindu Sena has gathered at Jantar Mantar to show solidarity with Trump, considered a polarizing figure in American politics. In May last year, when Trump was still just a candidate, the outfit held a Havan to pray for his victory in the elections. In October, they burnt posters of Hillary Clinton, former US Secretary of State and Donald Trump’s opponent, for “defaming the savior of humanity”. A day before Trump was sworn in as the 45th American President, the outfit even held their own ‘Raj Tilak’ (Coronation) ceremony for him.